Below is the analysis of the diphtheria, tetanus, and acellular pertussis (DTaP/Tdap) vaccine requirement for child care/school attendance in Washington State, submitted as part of the Informed Choice WA's Appeal of the decision of the Board of Health to deny their Petition. The Appeal was filed on April 17, 2019 with the Governor's Office. Re-printed with permission from Informed Choice WA. Full text of the Appeal can be found HERE. On November 8, 2017, the Washington State Immunization Advisory Committee (IAC) updated the criteria for state immunization requirements listed in Immunization Advisory Committee: Criteria for Reviewing Antigens for Potential Inclusion in WAC 246-105-030. 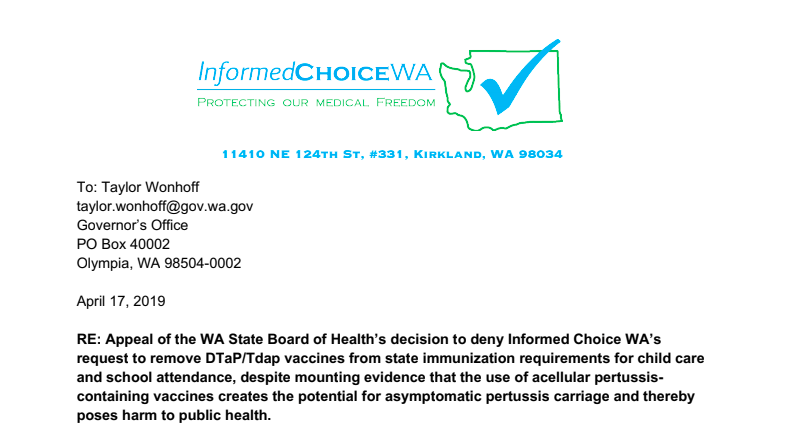 In the original correspondence on February 25, 2019 and in the amended petition on March 8, 2019, Informed Choice WA requested that the Washington State Board of Health (BOH) remove the requirement for DIPHTHERIA, TETANUS AND ACELLULAR PERTUSSIS VACCINE (DtaP/Tdap) for child care or school attendance in WA State. The BOH denied the request for reasons specified in their March 20, 2019 Letter to Informed Choice WA. Diphtheria disease is caused by the diphtheria toxin, which is produced and secreted by toxigenic C. diphtheriae bacteria. An inactivated form of the diphtheria toxin, called toxoid, constitutes the diphtheria vaccine and is part of DTaP/Tdap. There is no evidence and no biologically plausible mechanism that vaccination with the diphtheria toxoid reduces the risk of person-to-person transmission of toxigenic C. diphtheriae, since the vaccine-induced antibodies are directed only against the toxin and not against whole bacterium. The diphtheria vaccine can only prevent toxin-related symptoms of diphtheria. It does not prevent infection/colonization of the throat by toxigenic C. diphtheriae in the vaccinated. In fact, both vaccinated and unvaccinated children were infected with C. diphtheriae at the same rate in a Texas outbreak of diphtheria in the 1970s, as determined by Miller et al. 1972. “These outbreaks, the known importance of carriers in the spread of diphtheria, and the demonstrated failure of toxoid to prevent the carrier state lead us to conclude that the concept of herd immunity is not applicable in the prevention of diphtheria. A high level of community immunization will not stop the transmission of diphtheria…” (Miller et al., American Journal of Diseases of Children 1972). While the toxoid vaccine can only prevent the symptoms of disease, it was the use of antibiotics and quarantine that stopped the transmission and eliminated C. diphtheriae in the population. These measures are implemented whenever a rare case of diphtheria is detected, such that the toxigenic C. diphtheriae strain is now nearly non-existent in developed countries. The BOH’s requirement of immunization for diphtheria for child care or school attendance does not meet the IAC’s Disease Burden Criterion #6: “[v]accinating against this disease reduces the risk of person-to-person transmission.” The BOH’s Letter has not listed any specific reason to deny Informed Choice WA’s request to remove the diphtheria immunization requirement. Miller LW, Older JJ, Drake J, Zimmerman S. Diphtheria immunization. Effect upon carriers and the control of outbreaks. Am J Dis Child. 1972 Mar;123(3):197-9. PubMed PMID: 5026197. Immunization cannot reduce the risk of person-to-person transmission of tetanus because tetanus is not transmissible. Tetanus is a disease of improper wound care that has not had a high incidence rate in the general U.S. population, including school children, but rather was the disease of war zones and of neonates birthed in unsanitary conditions (neonatal tetanus). Even prior to the introduction of the DTP immunization program, which included the tetanus toxoid, the U.S. nationwide tetanus rate, dominated by neonatal tetanus, was only 3.9 cases per million, with a significantly lower than nationwide rate of tetanus in WA State (2.3 cases per million) back in 1947. There was never a randomized placebo-controlled clinical trial of DTP, DTaP, or any other tetanus toxoid-containing vaccine conducted to establish vaccine efficacy in tetanus prevention in the general population or school children, and immunization for tetanus is no guarantee that tetanus can be prevented. There are numerous published case reports of tetanus happening in immunized individuals with considerable antitoxin (antibody) titers, as described in the publications below. Abrahamian FM, Pollack CV Jr, LoVecchio F, Nanda R, Carlson RW. Fatal tetanus in a drug abuser with "protective" antitetanus antibodies. J Emerg Med. 2000 Feb;18(2):189-93. PubMed PMID: 10699520. Beltran A, Go E, Haq M, Clarke HB, Zaman M, Recco RA. A case of clinical tetanus in a patient with protective antitetanus antibody level. South Med J. 2007 Jan;100(1):83. PubMed PMID: 17269536. Berger SA, Cherubin CE, Nelson S, Levine L. Tetanus despite preexisting anti-tetanus antibody. JAMA. 1978 Aug 25;240(8):769-70. PubMed PMID: 671711. Crone NE, Reder AT. Severe tetanus in immunized patients with high anti-tetanus titers. Neurology. 1992 Apr;42(4):761-4. PubMed PMID: 1565228. Ergonul O, Egeli D, Kahyaoglu B, Bahar M, Etienne M, Bleck T. An unexpected tetanus case. Lancet Infect Dis. 2016 Jun;16(6):746-752. Review. PubMed PMID: 27301930. Passen EL, Andersen BR. Clinical tetanus despite a protective level of toxin-neutralizing antibody. JAMA. 1986 Mar 7;255(9):1171-3. PubMed PMID: 2868135. Pryor T, Onarecker C, Coniglione T. Elevated antitoxin titers in a man with generalized tetanus. J Fam Pract. 1997 Mar;44(3):299-303. PubMed PMID: 9071251. As a reason to deny Informed Choice WA’s request to remove tetanus immunization requirement for child care or school attendance, the BOH’s Letter alludes to a single pediatric case of tetanus that happened in 2017 in Oregon in an unvaccinated child — one case in more than 30 years. This tetanus case was most likely due to improper wound care on a farm (not in school), a wound that was not attended by medical personnel until tetanus set in 6 days later, as described in the Morbidity and Mortality Weekly Report, Notes from the Field: Tetanus in an Unvaccinated Child — Oregon, 2017. Apparently, every other unvaccinated child in all of Oregon avoided developing tetanus in the past 30 years. The BOH’s requirement of immunization for tetanus for child care or school attendance does not meet the IAC’s Disease Burden Criterion #6: “[v]accinating against this disease reduces the risk of person-to-person transmission.” The BOH’s stated reason to deny Informed Choice WA’s request to remove tetanus immunization requirement is not pertinent. The symptoms of pertussis (or whooping cough) are caused by toxins (e.g. the pertussis toxin) secreted by B. pertussis (and related strains) during infection. Pertussis was added to the WA State immunization requirements in 1979 when the whole-cell pertussis vaccine (then part of DTP) was in use. The DTP vaccine has since been discontinued in the USA and other developed countries due to unacceptably high rates of severe adverse reactions and replaced in 1997 with DTaP/Tdap (the acellular pertussis vaccines). The BOH failed to reevaluate DTaP/Tdap in accordance with the IAC’s criteria for state immunization requirements in a timely manner, despite mounting evidence for at least past five years that DTaP/Tdap vaccines would not meet the IAC’s Disease Burden Criterion #6 of reducing the risk of person-to-person transmission of pertussis. On November 27, 2013, the FDA News Release stated that “although individuals immunized with an acellular pertussis vaccine may be protected from disease, they may still become infected with the bacteria without always getting sick and are able to spread infection to others, including young infants, who are susceptible to pertussis disease.” This warning was based on now published findings by the FDA scientists that in the baboon model of pertussis, DTaP-vaccinated baboons, who were then exposed to B. pertussis, could transmit B. pertussis to susceptible cage mates without themselves developing the symptoms of disease (Warfel et al., Proceedings of National Academy of Sciences USA 2014). “If this baboon model truthfully reflects the human situation, these observations suggest that vaccination neither prevents infection nor circulation of the organism. 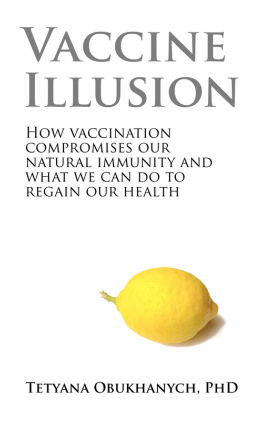 That vaccination does not prevent B. pertussis infection in humans, nor the circulation of the organism in human populations in any important manner, comes from the observation that the inter-epidemic intervals have not changed in a major way since the implementation of mass vaccination. A vaccine that prevents infection is expected to increase the inter-epidemic time intervals or to abolish the regular cycles altogether, since it would induce herd immunity, as observed for measles vaccines. Pertussis occurs in 3–5 years cycles, and mass vaccination, even with DTP, has only increased the inter-epidemic intervals by 1–2 years. Thus, even DTP has had only a minimal herd immunity effect, not sufficient to interrupt the circulation of the organism in the human population. In fact, a recent mathematical modeling study concluded that asymptomatic transmission is the most parsimonious explanation for the resurgence of pertussis in countries with high-vaccination coverage…” (Locht, Vaccine 2017). The BOH does not have the authority to discontinue the use of any FDA-licensed vaccine, and Informed Choice WA never requested that the BOH discontinue any vaccine. Dr. Cherry’s Pertussis Review article, describing a number of significant shortcomings of acellular pertussis vaccines without recommending their discontinuation, should not have precluded the BOH from following IAC’s own criteria in determining whether these vaccines are justified to remain on the list of requirements for child care and school attendance. The BOH’s requirement of immunization for pertussis (with currently available acellular pertussis vaccines) for child care or school attendance does not meet the IAC’s Disease Burden Criterion #6: “[v]accinating against this disease reduces the risk of person-to-person transmission.” The BOH’s stated reason to deny Informed Choice WA’s request to remove (acellular) pertussis immunization requirement is not pertinent. One of the shortcomings of acellular pertussis vaccines described by Dr. Cherry in his Pertussis Review article is the small number of antigens that acellular pertussis vaccines contain, resulting in linked-epitope suppression, which, in his own words, is a phenomenon when “the immune response to novel epitopes is suppressed by the strong response to initial components if they are introduced together…” (Cherry, Journal of the Pediatric Infectious Diseases Society 2019). Dr. Cherry’s own earlier research findings show that priming by either whole-cell DTP or acellular DTaP results in linked-epitope suppression, which becomes apparent during subsequent pertussis infection in the vaccinated. In 2010, Cherry and coauthors found that “[u]pon subsequent exposure and infection, previous DTwP or DTaP vaccinees respond more vigorously to the antigens contained in the vaccines with which they were immunized than to other B. pertussis proteins…” (Cherry et al., Clinical and Vaccine Immunology 2010). Prior to that, in 2004, Cherry and coauthors made a similar finding that "[p]rimary infections with either B. pertussis or Bordetella parapertussis stimulated a vigorous antibody response to ACT. In contrast, patients in whom DTP and DTaP vaccines failed had minimal ACT antibody responses…" (Cherry at al., Clinical Infectious Disease 2004). (ACT stands for adenylate cyclase toxin, which is an important mediator of pertussis disease. Neither DTP nor DTaP contain the ACT antigen). Dr. Cherry further mentions in his Pertussis Review article that acellular pertussis vaccines have low efficacy and short duration of protection from disease symptoms. Furthermore, Klein and coauthors found that “[r]outine Tdap did not prevent pertussis outbreaks. Among adolescents who have only received DTaP vaccines in childhood, Tdap provided moderate protection against pertussis during the first year and then waned rapidly so that little protection remained 2-3 years after vaccination…” (Klein et al, Pediatrics 2016). Another shortcoming mentioned by Dr. Cherry is that acellular pertussis vaccines elicit an inappropriate Th2 type of cellular immune response. But it’s the Th17/Th1 immune response, elicited by B. pertussis infection, that is needed to prevent pertussis re-infection. In the research paper by Warfel and coauthors, the predisposition to re-infection was absent in baboons who have had B. pertussis infection without first being primed by any vaccines. Whole-cell DTP priming made baboons susceptible to asymptomatic infection, which they cleared in 3 weeks, whereas DTaP-primed animals, when exposed and infected, carried pertussis bacteria asymptomatically for 6 weeks and were able to infect susceptible contacts (Figure 1A and Figure 3, Warfel et al., Proceedings of National Academy of Sciences USA 2014). Indeed, DTaP-primed animals failed to generate any IL17A (a marker of the Th17 immune response) and kept responding in a Th2 mode even when later infected with B. pertussis (Figure 5A, Warfel et al., Clinical and Vaccine Immunology 2015). Taken together, these data suggest that linked-epitope suppression and the inability to generate the Th17 immune response (due to permanent Th2 skewing of the immune response to pertussis) might set up a lifetime predisposition of DTaP-primed individuals to be (asymptomatically) re-infected with B. pertussis multiple times, thus increasing its re-circulation in communities. Then, it is the unvaccinated (unprimed by DTaP) children who would be the ones currently escaping linked-epitope suppression and developing proper Th17 responses to B. pertussis infection that would prevent their subsequent re-infection, and thus contributing the least to the re-circulation of B. pertussis in communities, despite being initially susceptible to symptomatic pertussis. The rising incidence of pertussis disease is a testament to how poorly DTaP/Tdap vaccines prevent pertussis, with some recent pertussis outbreaks affecting up-to-date vaccinated children, while sparing the unvaccinated.- The use of acellular pertussis vaccines drives the rise in pertactin-negative strains of B. pertussis. Pertactin is one of the pertussis antigens included in DTaP/Tdap vaccines, creating vaccine-driven selection for proliferation of pertactin-negative strains, a phenomenon analogous to antibiotic-driven microbial resistance to that specific antibiotic. Pertactin-negative strains are predominantly isolated from up-to-date vaccinated pertussis cases and constitute 74% of B. pertussis isolates in WA State (Martin et al., Clinical Infectious Diseases 2015). From the perspective of protecting infants who are most vulnerable to complications from pertussis, acellular pertussis vaccines create and perpetuate the potential for asymptomatic carriage and transmission of B. pertussis by vaccinated individuals, thus simultaneously magnifying and masking a public health hazard in child care settings, where an asymptomatically infected vaccinated person may be unknowingly carrying pertussis bacteria and spreading them to infants, instead of avoiding interacting with infants due to having pertussis symptoms. Finally, Dr. Cherry’s recommendation to use Tdap in pregnant women, as highlighted in the BOH’s Letter to Informed Choice WA, would be off-label use — i.e., not licensed by the FDA for use during pregnancy — and lacking adequately powered randomized placebo-controlled trials of clinical efficacy and safety during pregnancy for the mother and the offspring. Cherry JD. The 112-Year Odyssey of Pertussis and Pertussis Vaccines-Mistakes Made and Implications for the Future. J Pediatric Infect Dis Soc. 2019 Feb 22. [Epub ahead of print] PubMed PMID: 30793754. Cherry JD, Heininger U, Richards DM, Storsaeter J, Gustafsson L, Ljungman M, Hallander HO. Antibody response patterns to Bordetella pertussis antigens in vaccinated (primed) and unvaccinated (unprimed) young children with pertussis. Clin Vaccine Immunol. 2010 May;17(5):741-7. Epub 2010 Mar 24. PubMed PMID: 20335431. Cherry JD, Xing DX, Newland P, Patel K, Heininger U, Corbel MJ. Determination of serum antibody to Bordetella pertussis adenylate cyclase toxin in vaccinated and unvaccinated children and in children and adults with pertussis. Clin Infect Dis. 2004 Feb 15;38(4):502-7. Epub 2004 Jan 29. PubMed PMID: 14765342. Klein NP, Bartlett J, Fireman B, Baxter R. Waning Tdap Effectiveness in Adolescents. Pediatrics. 2016 Mar;137(3):e20153326. Epub 2016 Feb 5. PubMed PMID: 26908667. Locht C. Will we have new pertussis vaccines? Vaccine. 2018 Aug 28;36(36):5460-5469. Epub 2017 Nov 24. PubMed PMID: 29180031. Martin SW, Pawloski L, Williams M, Weening K, DeBolt C, Qin X, Reynolds L, Kenyon C, Giambrone G, Kudish K, Miller L, Selvage D, Lee A, Skoff TH, Kamiya H, Cassiday PK, Tondella ML, Clark TA. Pertactin-negative Bordetella pertussis strains: evidence for a possible selective advantage. Clin Infect Dis. 2015 Jan 15;60(2):223-7. Epub 2014 Oct 9. PubMed PMID: 25301209. Warfel JM, Zimmerman LI, Merkel TJ. Acellular pertussis vaccines protect against disease but fail to prevent infection and transmission in a nonhuman primate model. Proc Natl Acad Sci U S A. 2014 Jan 14;111(2):787-92. Epub 2013 Nov 25. PubMed PMID: 24277828. Warfel JM, Zimmerman LI, Merkel TJ. Comparison of Three Whole-Cell Pertussis Vaccines in the Baboon Model of Pertussis. Clin Vaccine Immunol. 2015 Nov 11;23(1):47-54. Print 2016 Jan. PubMed PMID: 26561389. The WA State immunization requirements for DIPHTHERIA, TETANUS, AND PERTUSSIS (with currently licensed DTaP/Tdap vaccines) for child care or school attendance do not meet the IAC’s Disease Burden Criterion #6: “[v]accinating against this disease reduces the risk of person-to-person transmission.” Furthermore, the acellular pertussis immunization program is failing public health. If you enjoyed watching this first lecture of the NIF class, please donate to Dr. Tetyana via PayPal. ​To watch all six lectures of the NIF class and attend monthly Q&A sessions with Dr. Tetyana, please join BBCH.